Continuing customer feedback, the latest from Costa Rica, requires that we bring you the following information. We have had reports that, under hard driving conditions, the aluminum axle clamp heim joint mounting bolt has a tendency to repeatedly loosen over a period of time. Please be sure to review this information and take the recommended appropriate steps. 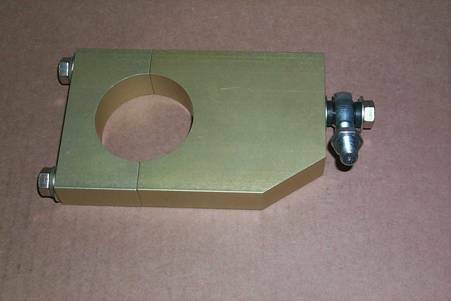 Many MGB owners that have fitted the panhard rod kit will readily recognize the above components. However, along with a longer heim joint mounting bolt 7/16” x 2.1/4” USS bolt, you will see the addition of a .02 FL OZ Locktite 271 Threadlocker High Strength ampule and an additional 7/16” SAE flat washer. The aforementioned owners should remove the original heim joint 7/16” x 2” USS securing bolt, dissolve any lubricant until dry, then apply Locktite 271 Threadlocker High Strength, or an equivalent product, to the bolt threads. Torque bolt to 60 lbs. Alternately, we will gladly send you a new replacement bolt, the 271 Threadlocker and an additional 7/16” SAE flat washer at no charge, via U.S. Postal Service. Assemble as per image P0002814. NOTE: Please observe curing times that are indicated on the back of the Threadlocker packet. Because applying 271 Threadlocker requires localized heat for bolt removal, please be sure you are satisfied with the horizontal position of the bar, and that you are not experiencing bar contact with body on the right hand side in the area of the trunk before proceeding. This is especially prevalent when making hard left-hand turns. 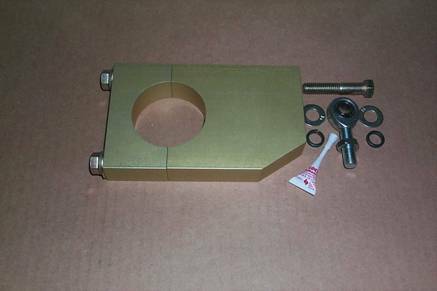 We will be upgrading the length of the bolt to 2.1/4” on future kit sales, as well as supplying the 271 Threadlocker High Strength and an additional 7/16” SAE flat washer within the panhard rod kit. New installers should initially install the 7/16” USS bolt dry, until the vehicle operational running rear ride height has been established, along with the horizontal position of the bar and any bar to body contact issues taken care of. Thereafter, the 7/16” USS bolt should be removed and the 271 Threadlocker applied to the threads. Torque bolt to 60 lbs.